Boulder City High School’s wrestlers took first place in the Boulder City Duals on Saturday, Dec 1, finishing as the only unbeaten program in the eight-team tournament. (Robert Vendettoli/Boulder City Review) Boulder City High School senior 220-pound wrestler Ryan Vanario grapples his Legacy opponent on Tuesday, Dec. 4. He won the match against Isaiah Sedillos by technical fall. Facing a tough road on their way to a 4-0 record, the Eagles defeated 4A programs Desert Oasis (69-12) and Desert Pines (57-24) and 3A program Chaparral (60-21), before routing 4A Rancho 60-18 in the championship round. In total, nine wrestlers went an undefeated 4-0 for the Eagles. Seniors Balmer (182 pounds) and Hayden Moore (160 pounds) and juniors Justin Bonar (126 pounds), Ladd Cox (152 pounds) and Cade Cowley (170 pounds) each recorded four pins for the Eagles. 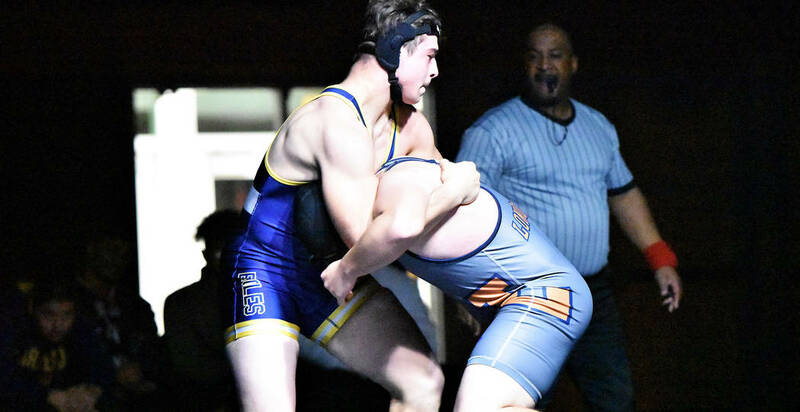 Also picking up four wins for the Eagles were seniors James Ewell (220 pounds), Ryan Vanario (220 pounds) and Mike Kaposta (285 pounds) and freshman Josh Fortheringham (138 pounds). Senior Jimmy Dunagan (195 pounds) finished 3-0, while junior Danny Pate (145 pounds) finished 3-1. Continuing to schedule the toughest opponents they can during their preseason slate, the Eagles defeated 4A programs Durango and Legacy on Tuesday, Dec. 4. Routing the Trailblazers 70-3 and the Longhorns 75-6, the Eagles have now defeated six 4A programs this season. Dunagan finished 2-0 on Tuesday with a pin fall victory against Legacy. Bonar also finished 2-0 with a pair of pins, while Pate finished 2-0. Picking up a pin falls against Legacy were Balmer, Cowley and Kaposta, while Vanario won by decision. Against Durango, Balmer and Fortheringham picked up pins as did juniors Jason Krumm (120 pounds) and Curtis Brown (126 pounds) and freshman Ben Schafler (106 pounds). Continuing their preseason gauntlet, the Eagles will travel to California this weekend for the La Costa Canyon Invitational. They’ll also host Mojave on Wednesday, Dec. 12.